I know what we consider hot weather here is what a lot of you consider a nice day. But it's 70 today and that's a bit warmer than is comfortable. Baking on the 4th of July is NOT going to happen. 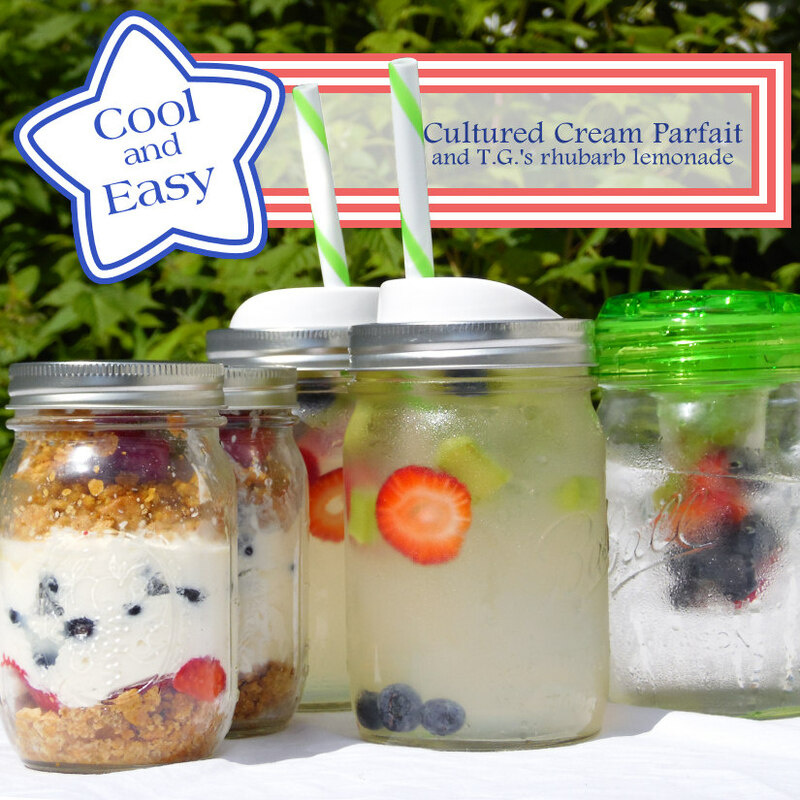 But no bake desserts in jars? That's easy, cute and transports well. So starting from the left- those are no-bake parfaits. There are a lot more berries than it appears and it's two of my favorites- strawberries and blueberries. Put the yogurt and cream in a 1 qt jar, screw on the lid, shake once, then set in a warm place overnight. After about 12 hours the cream will be very thick when you tilt the jar. Put it in the fridge to chill. Rinse the strawberries and blueberries. I got a quart of strawberries and a pint of blueberries, there was some leftover for about a minute. Slice the strawberries.Put berries in the fridge until the cream is whipped. Mix the chilled cream with 1/4 cup super fine sugar, 1 tsp vanilla and if you have it, 1 tsp Grand Marnier. Whip the cream! With cultured creams, I've found my cream whipper does not work well, even if they are really cold. Whipping by hand with a whisk works great and an electric mixer would probably work too. I prefer the whisk because it's quiet and quick. Put a few spoonfuls of the crumb mixture in the bottom of each of your jars, then put in a 1/2 inch layer of strawberries, add cream, add blueberries, add cream, continue alternating until it's nearly full, then top with more graham cracker. A nice addition is to fancy slice a strawberry so you can fan it out on top before putting the lid on. Culturing the cream adds a delicious tangy flavor, and makes for a smooth, silk like cream. The crumbs and berries provide texture and flavor. My daughter likes to whip in some cocoa powder as well for hers because everything is better with chocolate. Speaking of my daughter, she made lemonade and measured this time. For those of you living where you can consistently get good lemons, LUCKY!! We use lemon juice because it's more consistent. Yes, I have jar love. I also have some of the newest products from Ball Canning to show off. Fill with cold water to the top line. Lid, shake well. Slice up a 4 inch piece of rhubarb, add whatever other fruits sound good. She did! Then lots of ice. 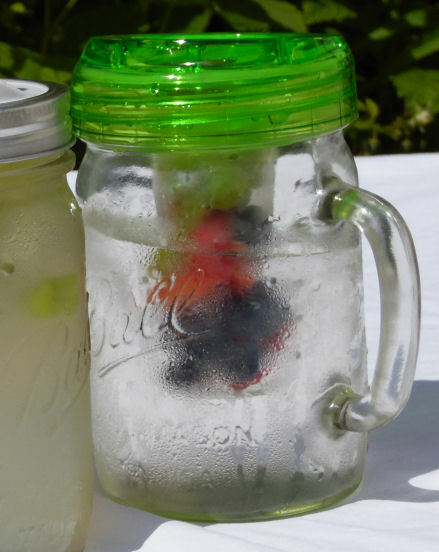 Pour the lemonade over the fruit and ice, and use a Sip and Straw lid and a wide mouth jar band. The nice thing about doing it this way is that she can customize the drinks a bit. Like her dad likes it just like that, but she likes it more sour so she makes hers with more lemon, and a touch more sugar. Another new product, like the Mason Drinking Jars, and the Sip and Straw Lid that's just really neat is the infuser. This works with wide mouth jars- like the big Ball® Mason Drinking Jar (they do have a regular sized version of the drinking jar as well) or the tall Ball jars you use for things like asparagus. I love this. The Sip and Straw lids are NICE. They have reusable thick straws, perfect for smoothies and shakes. The infuser lid though, that's perfect for people like me that try to stay hydrated but like a little flavor. Shown above, it has rhubarb, blueberries and strawberries in it, but soon it will be raspberries from my yard. Yum. It has a drinking hole on top, and has a gasket for a tight seal. The basket is big enough for a nice amount of goodies. The jars, the mugs, the drink lids are all available on their site- and it's been re-designed to be more mobile friendly. The lids, jars and mugs were provided to me at no cost. No other compensation was given, and my love for Ball® Canning products is real.